When your story arc’s title is “Wolverine Goes To Hell,” really, how much description is needed? It’sclear, straight to the point, and it doesn’t make you think, “I wonder where they’re going with this?” They just come right out and tell you. Written by Jason Aaron with pencils by Renato Guedes, Wolverine #5 is the final part of the “Wolverine Goes To Hell” arc. 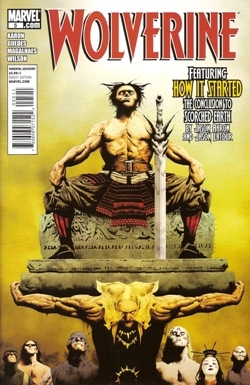 Beginning in issue one, this arc has shown Wolverine, as the title not-so-subtly tells us, cast into Hell. There, he has had to fight people that he has killed in the past and even the devil himself. Meanwhile, a demon has taken control of his body on Earth and is hunting down and killing those he cares about. One of the biggest surprises in this story arc has been Wolverine encountering his biological father in Hell. We learn in this issue that his father was one of the masterminds behind sending Wolverine to Hell. Up to this point it looked like the eventual meeting between Wolverine and his father would yield some Earth-shattering results, but unfortunately it turns out that Logan Sr.’s whole reason for getting his son into Hell was to, A) have Wolverine take over Hell so that they could rule together, and, B) to tell Wolverine that he’s proud of him. That’s it. Everything that it has built to is a brief father/son moment. Logan Sr. tells Wolverine that the Logan family is well known for being murderers and all around bad people, a legacy that, according to Logan Sr., Wolverine has more than lived up to. Having no intention of staying in Hell or having anything to do with his father, Wolverine fights Sabretooth for control of the Soul Sword, the bearer of which is the king of Hell. Once Wolverine gets it, he dismembers Sabretooth and throws the sword into the army of demons, who squabble amongst themselves for control of it. Meanwhile, back on Earth, Mystique, Johnny Blaze, Dan Ketch, Daimon Hellstrom (Son of Satan) and Melita (Wolverine’s girfriend) are attempting to bring the demon possessed body of Wolverine down. They manage to get him into a church where Hellstrom is going to perform an exorcism. Back in Hell, amid the confusion caused by the fight for the sword, Wolverine and Puck attempt to climb their way out of Hell. On their way out, Logan tries to free his former lover, Mariko, but she tells him that she has no life to go back to. Wolverine and Puck continue their climb but Puck is pulled back down into Hell by the demons. Don’t feel bad for him though. Once he gets to the bottom of Hell, he gets his hands on the Soul Sword and becomes the new king of Hell. As Wolverine is climbing out of Hell, Hellstrom completes the exorcism back on Earth, bringing Logan’s soul back into his body and banishing the demon to Hell. The dazed Wolverine runs screaming from the church, only to be intercepted by and angry Cyclops, demanding to know what’s been going on. The story in this arc overall has been great but this issue felt really anti-climactic. The last time Logan Sr. was featured in any comic book (as far as I know) was way back in Origin, over a decade ago. There’s so much that could have been done with his reintroduction, especially with the lead up they’ve had in the past 4 issues. But, the only reason for all the buildup of sending Wolverine to Hell was so that Logan Sr. could tell Wolverine, “I’m proud of ya’, son, ” for being a bloodthirsty killer and making the family name, Logan, feared. It’s not horrible, just a let down. The next story arc appears to focus on the mystery man working behind the scenes who set all these events in motion. I can’t wait to see what his story is and what his beef with Logan is. Guedes’ art is really solid. It suits the story and mood very well. It’s interesting to note that for some reason, Wolverine is beet red throughout the story, as compared to the other characters. I’m not entirely sure why, perhaps it’s supposed to suggest that the longer Wolverine has stayed in Hell, he’s become more and more of a demon. This would be a good question for the colorist, Matthew Wilson. Overall, this is a good issue, especially for wrapping up “Wolverine Goes To Hell,” but it was a bit anti-climactic. Definitely stick around for the next arc. That should be good.